Anonymous Mexico is going head-to-head with one of the most dangerous criminal organizations in the world, the Mexican cartel Los Zetas. With this Anonymous Proofs that they are not just a common Internet users as cowards behind a keyboard. Not only has the Anonymous threatened to reveal names, but it has also started making good to its threats. 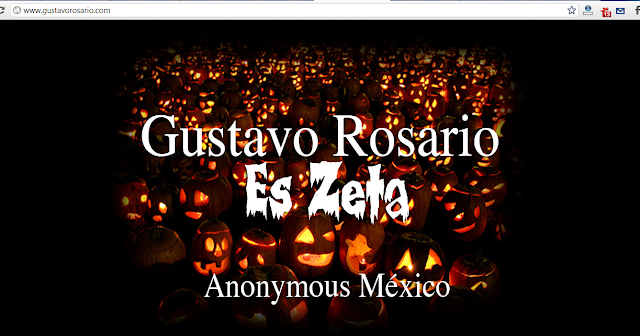 Mexican Anonymous hackers is warning a Mexican drug cartel to release one of its members, kidnapped from a street protest, or it will publish the identities and addresses of the syndicate's associates, from corrupt police to taxi drivers, as well as reveal the syndicates' businesses. "You made a huge mistake by taking one of us. Release him," says a masked man in a video posted online on behalf of the group, Anonymous. Here is the Spanish speaking video put out by Anonymous. As Mike Vigil, a retired head of international operations for the DEA said following this announcement – the Zetas Cartel needs to take Anonymous seriously because by publishing the names they identify the Zetas Cartel members to rivals and they will go after them.